This week provided two unique opportunities for SAP to interact with students from two of America’s leading universities; Notre Dame and Stanford. On Monday SAP was invited to speak to MBA students who are part of the Business Intelligence club at Notre Dame’s Mendoza College of Business. On Tuesday, a group of twelve Stanford students visited the SAP Fieldglass office in Chicago as part of an innovation tour in the city this week. We were fortunate to have Brent Wyffells, SAP Solution Engineer for Analytics, present an overview of SAP Analytics solutions to the BI club members. Brent shared the current business intelligence challenges experienced by SAP customers and discussed how SAP solutions can address those needs. He included a demonstration of SAP software which illustrated the power and flexibility of creating insights that lead to meaningful actions. Students were able to ask questions and learn about products like SAP Business Objects Lumira and SAP Business Objects Predictive Analytics. As future business leaders, this information will help them to accelerate their use and understanding of our analytics solutions. SAP received a request to host a group of Stanford students at one of our Chicago offices this week as part of their innovation tour of Chicago. The students are all part of BASES – The Business Association of Stanford Entrepreneurial Students and came from a diverse set of academic disciplines. In addition to showing them the beautiful SAP Fieldglass office, we covered a number of topics related to SAP and innovation. 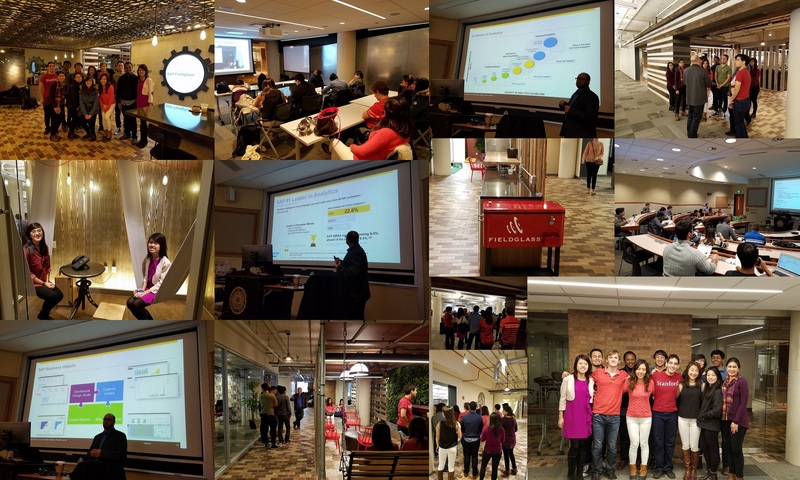 The Stanford students had a number of great questions about innovation in Chicago, how SAP engages with our customers and business partners and some of SAP’s innovations for various industries. We had a very good discussion. By discussing and demonstrating how SAP participates in the innovation ecosystem we encouraged them students to learn more about SAP and to contribute to entrepreneurship and intrapreneurship while still students and after graduation.